Salmon in River Tornionjoki grow big. 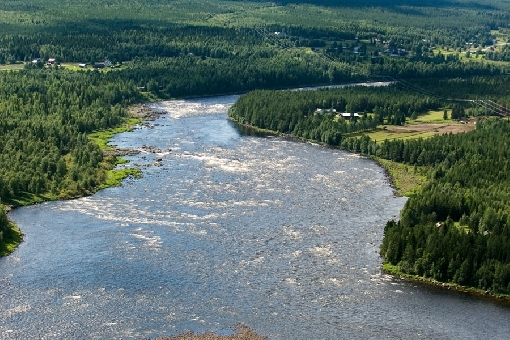 River Tornionjoki is a major stream flowing almost in a natural state on the border between Finland and Sweden. The river is the largest free-flowing salmon river in Europe and catches have increased sharply in recent years. It is a traditional waterway to the furthermost end of Lapland and people living on the riverside often refer to it simply as the ‘Way’. During the peak salmon migration period, the most popular rapids get congested. 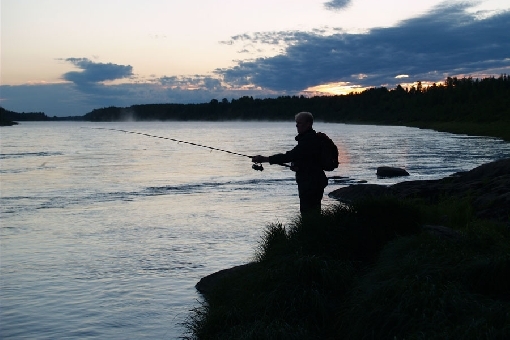 If you wish, however, it’s possible to fish in peace on River Tornionjoki as well. 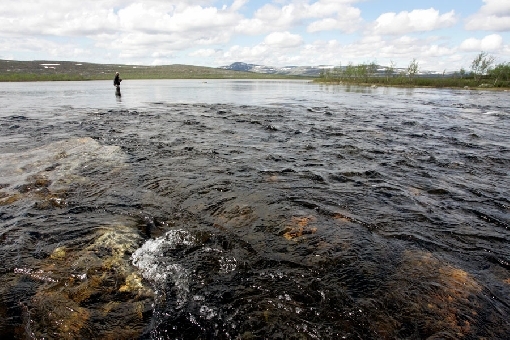 Upstream from Kolari, the river continues as River Muonionjoki, with headwaters reaching through to the heart of the wilderness of Northwest Lapland, all the way to the upper courses of its tributaries, Rivers Lätäseno and Rommaeno. This is where the world-class big grayling areas are located. 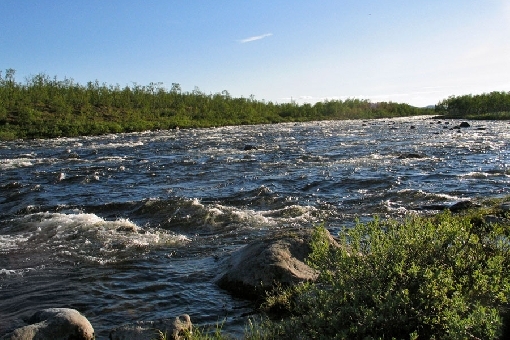 The most well-known rapids in River Tornionjoki are the Kukkolankoski, Matkakoski and Vuennonkoski Rapids, listed in order starting from downstream. Moving upriver, you’ll meet the Korpikoski Rapids, the Lampassuvanto Pool and the Kirakka and Lappea areas. There are dozens of splendid rapids and pools along the river, where your ratchet may be buzzed by a big salmon. 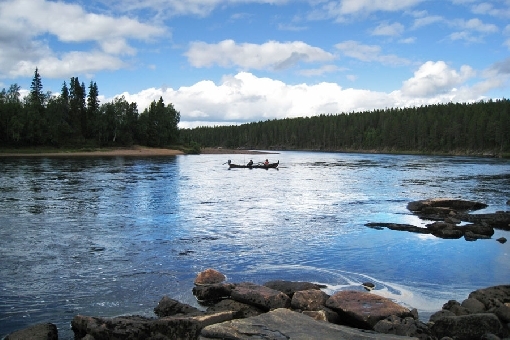 On River Tornionjoki, salmon and sea trout are pursued by trolling plugs on rowing boats. You can also fish from the banks and flies are also used on rapids areas. However, the best way to comb through the hot spots is to fish from a boat. There are several makers of salmon plugs along the Tornionjoki riverside, while local anglers also troll many home-made lures. Trolling for salmon on a rowing boat is the main form of fishing on the ‘Way’. 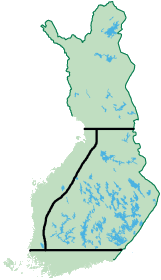 The most popular trolling areas are concentrated in the Municipalities of Pello and Kolari. A comprehensive choice of rowing boats and fishing guide and accommodation services is available. River Tornionjoki is the most important salmon river on the Baltic Sea and the salmon catch caught on the Finnish side of the river amounted to 57 tonnes in 2008, which was 2.5 times the figure for the previous year. Catch quantities can be expected to increase further, as fishing with drift-nets was discontinued in the Baltic Sea at the beginning of 2008. In 2012 the total catch increased rapidly indeed and was 122 tonnes (15 000 salmon). In 2014 the total catch reached the peak of 147 tonnes (18 000 salmon) of which 124 tonnes was caught on the Finnish side of River Tornionjoki. Salmon in River Tornionjoki grow big, the average being about 6 to 8 kilos. The largest specimens weigh over 15 kilos. 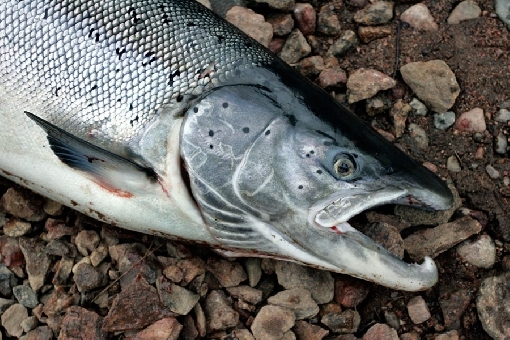 A 14.5-kilo migrating male salmon struck a plug downstream from Pello. While River Tornionjoki is famous for its big salmon, it is also a top-notch grayling site. 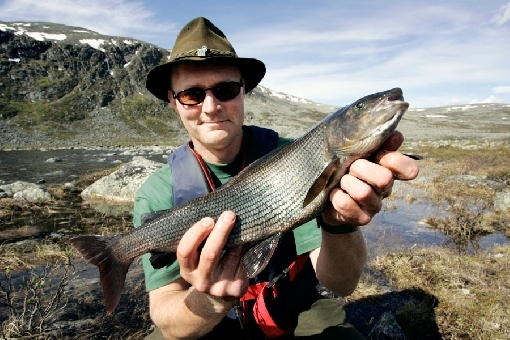 Every year, people catch the largest grayling in Finland, around two kilos, from the upper reaches of the river, consisting of its tributaries Könkämäeno, Rommaeno and Lätäseno. One-kilo grayling are common in this area, but sizeable specimens are found throughout the river. Grayling are also pursued in winter. Mild-flowing pools are favourite spots for grayling in winter. Along the Way, anglers may also be surprised by an occasional sea trout weighing a couple of kilos. The wild sea trout of River Tornionjoki is an endangered species. The annual catch is about 2 tonnes with the majority caught from the lower course of the river. 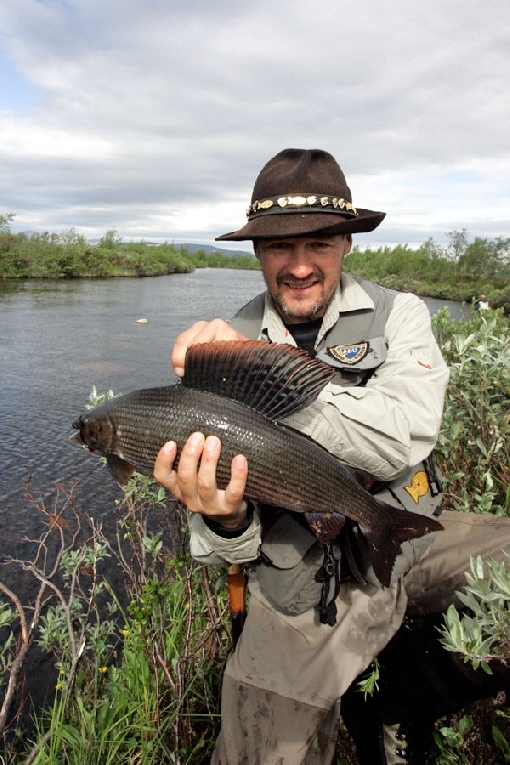 In Mountain Lapland, good grayling spots are often located around the tree line. The headwaters of River Tornionjoki flow through spacious fjeld landscapes, far off the beaten track. These great grayling areas can only be reached in summer by walking for a couple of days or by air. The lower parts of the river run wide and fast-flowing in the middle of the forests. The river runs for long stretches as mild-flowing pools and faster races through the district’s villages, occasionally turning into roaring rapids. In summer, the number of mosquitoes on the riverside can at times be extremely high. A couple of bottles of mosquito repellent are therefore a must when packing for a fishing trip. 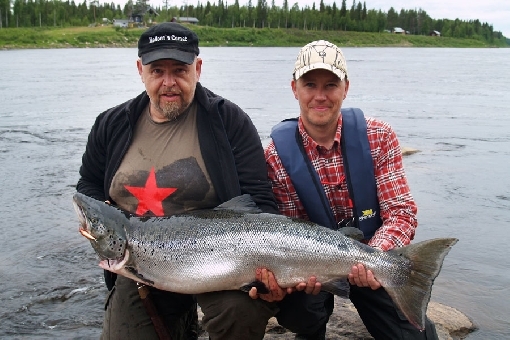 You can go fishing on River Tornionjoki with a single comprehensive fishing licence. The licence is reasonably priced, making River Tornionjoki probably the cheapest salmon river in the world. The Vuoennonkoski Rapids in the lower reaches of River Tornionjoki is an early-season hot spot. Fishing season for salmon 1st June to 15th August. Weekly closed season 7 pm on Sunday to 7 pm on Monday. Minimum sizes 50 cm for salmon, 35 cm for grayling. Catch quota one salmon per day per angler. Trout is protected. All trouts must be released back to water dead or alive.